Is the Torque Converter the problem? It is the usual suspect in transmission drivability problems, but is it always guilty as charged? To arrive at the right conclusion we first need to take a little journey into the background. 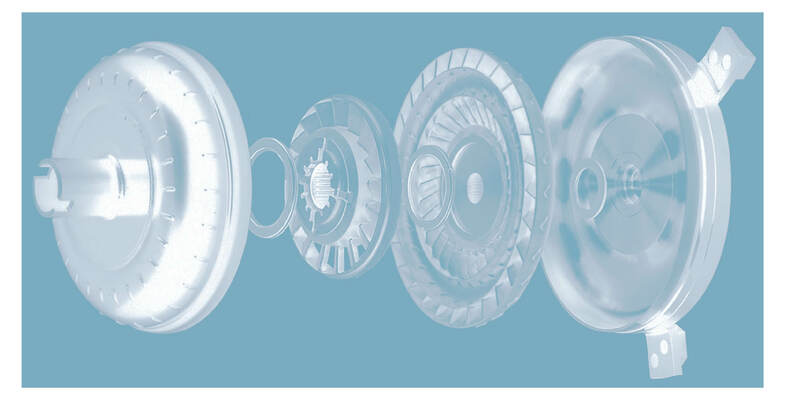 Anyone who has ever dealt with automatic transmissions, sooner or later encounters the torque converter. Cars with an automatic transmission need a solution to keep the engine running while the gears are stationary. Here’s where the converter makes its appearance. Being a type of fluid coupling it allows the engine to spin independently of the transmission. In addition to this, by clever design it also gives your car more torque when you accelerate from a stop. Some converters have a lock-up clutch, this locks the turbine and impellor of the converter together at predetermined speeds thereby eliminating the slippage and thus improving efficiency. So far so good, but what can go wrong? To tell the truth: the problem with the converter is that it's a sealed round object, so all you can do is guess what is happening or not happening inside this vital connection to the transmission. Problems caused by unrelated parts for example, a contaminated magnetic part in the CFT23 Mechatronic unit can lead to failure of lock-up, falsely leading you to believe that the converter is letting you down. So let’s look at the issues these guys can give you or you think they give you. One of the most common failures, especially with new generation converter types, is malfunctioning of lock-up. The use of oils other than the ones recommended by the manufacturer, is a problem that is rapidly working its way to the top of the list. Even though often thought of as just another marketing trick, there are actually fair grounds to take the recommendations very seriously. The oil for modern transmissions and converters is the result of extensive research and development between the oil company and transmission manufacturer, replacing it by another oil with even slightly different ingredients can cause major problems in your lock-up. Mercedes and ZF converters are especially sensitive to the use of correct oil. The lock-up lining is usually the first to suffer from an incorrect oil choice as the linings friction coefficient and oil viscosity do not “match” the values the transmission controller expects. Engine coolant, or glycol, contamination in the oil is a major influence on the correct functioning of the lock-up. This is caused by a loss of integrity between the water and oil cooler sections of the radiator allowing interchange to take place. The defective oil cooler is usually installed inside the radiator. Volvo, Opel, Audi and Mercedes are among the most common sufferers from Glycol contamination. Glycol affects the friction coefficient of the lock-up lining. A high concentration of Glycol will loosen the linings adhesive. Wear of parts in both converter and transmission can lead to apparent converter problems. Unusual, rattling noises are a common signal that debris from worn parts has ended up in the wrong place at the wrong time. For example: the bearings in the new generation Aisin Warner 6 Speed converters are a regular candidate. The debris produced can contaminate and damage seals, as well as jam valves within the transmission. When the lock-up seals are worn down, there is a loss of pressure and possibly a total failure of the lock-up. The Frictions will burn and eventually vanish completely. Severe wear of the seals results in a no lock-up condition. The one way clutch, or sprag, can fail in the stator of the Mercedes, 6 Speed Aisin Warner and various types of Peugeot and Citroen. This will make the car accelerate poorly as the increase in torque is no longer there. Springs of the damper plate can break, which makes a rattling noise. Naturally these broken parts can wind up in the vanes of the turbine, stator or impeller causing major damage. Some converter types are known for cracks in the impeller hub. The consequential damage of the metal clad seal leads to leakages. The lock-up piston sometimes bends too far, it touches the converter cover. This happens when the regulated lock-up pressure is too high, leading to insufficient lock-up. It is a result of valve body wear. Just replacing the converter takes away the problem but not the cause. The Turbine splines can bend and eventually totally break away, as a result there is no drive whatsoever. New types often have Torsion Springs mounted between Turbine and lock-up clutch. When these break a distinct rattling noise can be heard. Unfortunately this almost always results in massive damage, which makes repair nearly impossible. Finding a core is often the best solution in such a case.